The U2-UFO is the ultimate in computer case experience. Coming in at 18 inches cubed this box can hold just about anything and everything your heart could desire in a computer case. They can house up to 5 x 5.25 devices and up to a whopping 18 hard drives using Mountain Mods 120mm Fan Hard Drive brackets. Whether you are cooling with air, water, or phase changing solutions this is the case that can do it all. Not only does the U2-UFO have space to hold your high end components but with the high volume of air flowing in and out of the case it will keep them operating at cooler temperatures resulting in longer life and better performance. 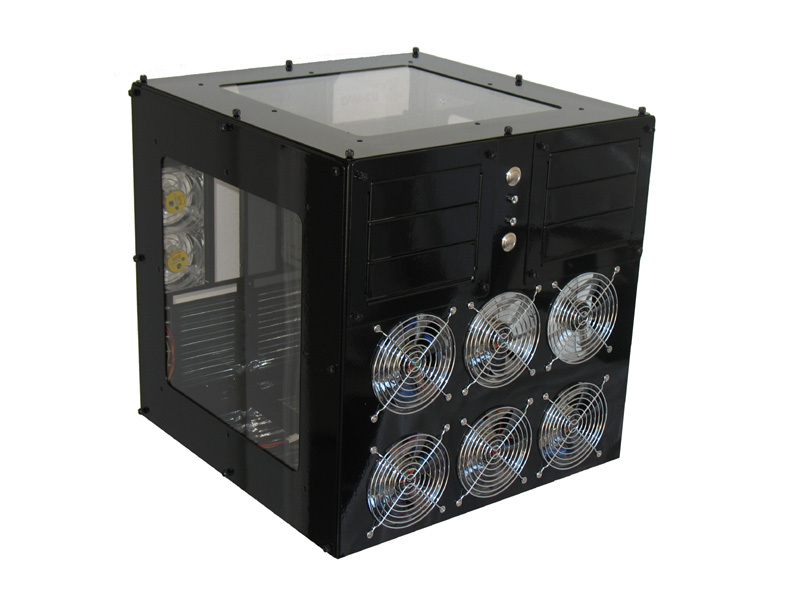 The Duality series of the U2-UFO offers you the ability to house TWO FULL ATX motherboards in a single case. The left side uses the standard ATX positioning while the right allows for another ATX motherboard in an inverted position. Four power supply ports are available for the heaviest of loads. Six 120mm intake blow holes are aligned for the use of TWO Thermochill 1203 radiators. Making this case capable of cooling two seriously hot systems. This version of the U2-UFO series is great for users that have a need for two systems. The U2-UFO is fabricated by skilled workers in the USA. It is made from thick aluminum making it lightweight, sturdy, and thermally friendly. Casters are included for easy mobility.